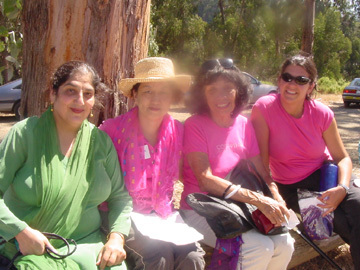 The CodePink and Global Exchange held a three day “Women Activism Camp” in Castro Valley. ii.Impact of the USA Patriot Act on civil liberties. Ms. Faheem gave a brief introduction of Islam. She said that Islam stands for peace and justice for all. She also spoke about the status of women in Islam and breaking the myth about the role of women in the Muslim society. Ms. Faheem explained that there is a misconception about the status and role of Muslim women. She said that Islam gives equal rights and responsibilities to women and reminded that Islam gave these rights at a time when women did not enjoy any rights in any other society. On Patriot Act, Ms. Samina Faheem asked the group, did you know that the law was introduced only six days after the 9/11 tragic events. It was passed after only 33 days without much discussion or following the standard law making procedure. Apparently, our administration took advantage of our nation’s fear. Attorney Ms. Riva Enteen, Program Director of the SF/Bay Area Chapter of the National Lawyers Guild, said that less than two years after Congress passed (on Oct. 26, 2001) the USA Patriot Act, giving new, sweeping powers to the federal government to compile information on ordinary Americans, Attorney General John Ashcroft now wants to introduce legislation (Patriot Act II) that would further erode constitutional checks and balances. Attorney Natalie Wormeli of ACLU Davis also spoke on the impact of the Patriot Act on civil liberties. She asked the group in the past year, if anybody has donated money to any non profit organization, please stand up. When everybody stood up, she said all of you can be considered terrorist under the Patriot Act and if the Patriot Act II is passed, then your citizenship could be stripped away. There was a lively discussion about how to break barriers between the various communities. 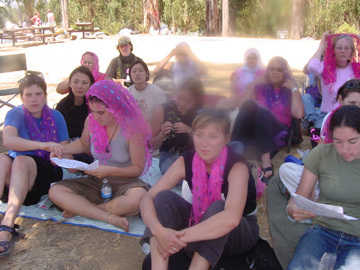 One of the objective of the camp was finding ways to gain solidarity with Arab and Muslim women in their organizations as well as how to create coalitions with Arab and Muslim women's groups.